ZHUHAI, China - American CoCo Vandeweghe will square off against Germany’s Julia Goerges on Sunday in the final of the last WTA event of the season, the Hengqin Life WTA Elite Trophy Zhuhai. 1. Vandeweghe’s going for the third and biggest title of her career. Her first two titles both came at the International-level grass court event in ’s-Hertogenbosch, the Netherlands, in 2014 and 2016. 2. Goerges is going for her fourth career title, but not her biggest. Two of her three previous career WTA titles were at the Premier level, at Stuttgart in 2011 and Moscow just a few weeks ago. 3. Vandeweghe is guaranteed to break the Top 10. No matter what happens in the final, she’ll be just the second new American woman to make her Top 10 debut since Serena Williams did it in 1999 (the only other one to do it since then is Madison Keys, who climbed as high as No.7 last year). 4. Goerges can’t break the Top 10, but she could set a new career-high. If the No.18-ranked German loses today, she moves up to No.16. But if she wins she’ll rise to No.14, which would beat her previous high by one spot - she went as high as No.15 in the world all the way back in 2012. 5. These are two of the tour’s biggest ace machines. 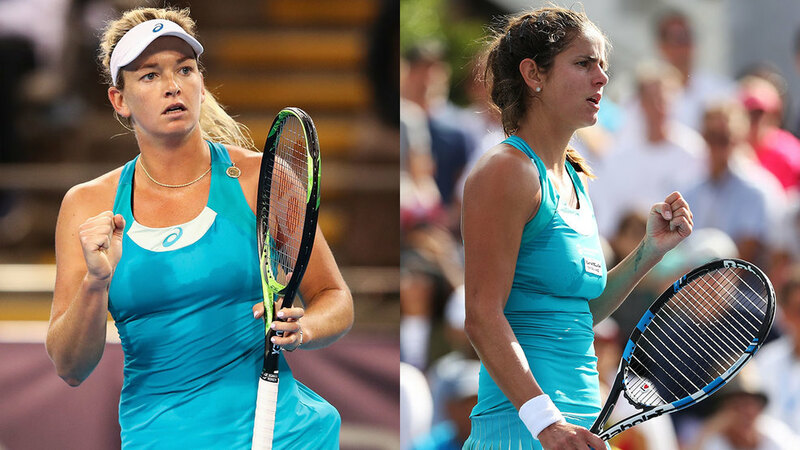 Coming into this week they were both in the Top 10 for most aces on the year, Goerges in second place with 401 and Vandeweghe in ninth place with 226. And they’ve continued to increase those totals in Zhuhai to 410 and 248, respectively. Fun fact: Goerges is just the third woman ever to pass 400 aces in a season, joining Serena Williams (who did it in 2012, 2013, 2014 and 2015) and Karolina Pliskova (2014, 2015, 2016 and 2017). 6. Goerges is on an eight-match winning streak. With five wins in Moscow and three wins so far here, she’s one win away from tying the longest winning streak of her career (nine in a row in 2011). 8. The head-to-head is tied, 2-2. Vandeweghe leads 2-0 on hardcourts, though, winning at Tokyo in 2010 and Fed Cup earlier this year (by retirement). Goerges’ two wins both came on clay courts. 9. Whoever wins this title joins some pretty good company. This is the third edition of the tournament and the first two winners were both multiple Grand Slam champions and WTA legends - Venus Williams (a former No.1 with seven majors) and Petra Kvitova (a former No.2 with two majors).